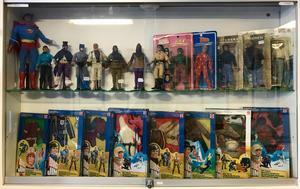 Nostalgipalatset - STAR WARS * BIG JIM * TRANSFORMERS * GHOST BUSTERS etc. Home » Toys » STAR WARS * BIG JIM * TRANSFORMERS * GHOST BUSTERS etc. STAR WARS * BIG JIM * TRANSFORMERS * GHOST BUSTERS etc. Lots of new vintage toys in our cabinets! * To ENLARGE any image - simply click ON it. Welcome to our shop - the stuff shown here is always available instore for viewing and eventual purchase(NO mail order on these items).